The installation of concrete pile jackets is a widely used method of repairing deteriorated piles. 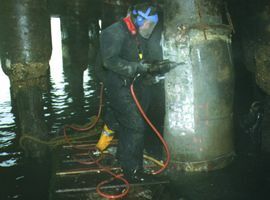 Hudson Marine has many years of experience on pile jacket projects in both inspection and installation. Quality control with projects of this nature is essential, because the repair work can only be seen by divers. Hudson Marine will provide first-class work at competitive prices.